Photos are © Allen W. Wright. 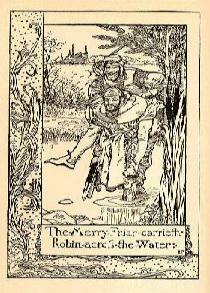 The Howard Pyle and Louis Rhead illustrations are courtesy of The Robin Hood Project at the University of Rochester and are used with permission. In 1427, about two decades before the earliest surviving ballad, there's a reference to pay 20d (pence) to actors in a Robin Hood play. By 1600, there are more than 130 references to performances of the Robin Hood legend -- more references than to any other kind of British folk drama. Obviously, the plays had an important role in Robin's career . There's some debate which came first -- the ballads or the plays. Most historians believe the Robin Hood legend originated in ballads, but the two traditions grew up side by side. The earliest existing play, a dramatic fragment from around 1475 (sometimes called Robin Hood and the Sheriff) resembles the story of Guy of Gisborne. And two other early plays published together, Robin Hood and the Friar and Robin Hood and the Potter also resemble two ballads -- an early one about the Potter, and a much later one called Robin Hood and the Curtal Friar which first appears after the play version. In these plays, there was a lot of mock combat. Robin fights the potter, the friar and the knight (known as the yeoman Guy of Gisborne in the ballad). There is sword play, battles with the staff and archery contests. The Robin Hood plays were often associated with the May Games, performed during Pentecost and Whitsuntide. Some historians also connect them with May Day celebrations and the Morris dances. There were Robin Hood plays and games held at various times in the year. Robin Hood became almost a mythological figure through his association with the May Games. The first record of a Robin Hood play is from Exeter, only a few years after the city's first recorded May Games . Professor Lorraine Stock notes that Exeter Cathedral is filled with "Green Man" imagery, the human head with foliage growing out of his mouth. The Green Man, like Robin, has ties to the virgin Mary. (The Exeter Cathedral is dedicated to her.) The chapter house of Southwell Minster -- once in the heart of Sherwood Forest -- also is home to numerous Green Man carvings. Stock feels that the traditions of the Green Man and the Wild Man influenced the growth of the Robin Hood legend. At the May Games, Robin did have a mythological presence as a King of the May or Summer King. And as a kingly figure, the person who plays Robin Hood would lead a procession. With a town full of followers, Robin would go to another town and collect money. Usually this money went to help the church. Holt believes that perhaps the money collected for the church was distributed to the poor. Hence, the expression that Robin Hood robs from the rich to give to the poor. Whatever the case, these plays were a big draw. In 1571, one town bought gunpowder to welcome Robin Hood. Bishop Hugh Latimer recalled in one sermon that in the 1530's he visited a town where the church was empty, because "it is Robin Hoodes day." And in 1510, Henry VIII acted as Robin Hood as he and 11 nobles snuck into the queen's chamber. But as Knight points out, there was a darker side to the Robin Hood celebrations. Real outlaws could be inspired by Robin Hood, such as in 1441 when some disgruntled people in Norfolk blocked the road threatening to murder someone. They sang "We are Robynhodesmen -- war, war, war." This is one of many examples. And chroniclers compared outlaws to Robin Hood. Like the Derbyshire outlaw Piers Venables who in 1439 rescued prisoners. The record of the event states "beyng of his clothinge, and in manere of insurrection wente into the woodes in that county like it hadde be Robyn Hode and his meyne." Comparisons to Robin Hood may have been going on a very long time. There are court roles where criminals are given the last name "robehood." Holt, in particular, believes these are clearly inspired by the stories of the famous outlaw. The earliest example of this was discovered by David Crook in 1984. The memoranda roll for 1261 refers to a Berkshire fugitive William, son of Robert le Fevre. But the roll from 1262 calls the same outlaw "William Robehod". However, the evidence in these cases is by no means certain. And it's possible that the nickname "Robin Hood" inspired the legend, and not the other way around. But the May Games not only inspired real life outlaws. It also brought new members into Robin Hood's legendary band -- Friar Tuck and Maid Marian. Tuck and Marian, as I've said above, are nowhere to be found in the early ballads. In fact, they seldom appear in the later ones too. But in the 1475 play, "Frere Tuk" is a member of Robin's band. This Tuck isn't the jolly overweight fellow of later Robin Hood stories. It's likely that this original Tuck was based off Robert Stafford, a real life priest who in 1417 used the alias Frere Tuk for his outlaw activities. Tuck is the Friar in the play Robin Hood and the Friar (in the later ballad version, the friar is unnamed.) Here, Tuck may owe something more to the traditional figure from May Games and morris dances figure of a jolly friar. R. B. Dobson and J. Taylor feel that the two friars may have been joined together to make the Friar Tuck we know and love. At the end of the play about the Friar, Robin gives an unnamed woman to Tuck when he joins the band. Some feel that the woman Tuck dances with is Maid Marian. Marian seems to have entered the legend through the May Games. Early references suggest her early May Games appearances were not connected to Robin Hood. She first appears in a French romance from 1280, Jeu de Robin et Marion. But this Robin was not Robin Hood, he was a shepherd and Marion his shepherdess. However, when Marian was brought into the May Games, it seems only natural to have made her the lover of Robin Hood. By the late 16th century, Marian's presence was firmly established in references to the outlaw. It was only one of many changes to the Robin Hood legend. Click here to view the general information sources used to write Wolfshead through the Ages: The History of Robin Hood. Click here to view additional information sources used for this specific section.